Audi’s new EV, the e-tron, will have a luxury price but a sub-luxury range of just 204 miles per charge when it arrives in U.S dealerships in May. Given that the typical EV struggles to stay within 15 percent of the EPA range number when being driven at highway speeds, that means most Audi e-trons likely will deliver under 200 miles if driven from full to empty without interim charging. The automaker released the number – which hasn’t yet been posted on the EPA’s fueleconomy.gov site – with an explanation: It decided to stress battery longevity over longer-distance driving range for the first Audi EV. As a result, the SUV-styled e-tron crossover will compare poorly at first glace to EVs such as the 295-mile Tesla Model X Long Range or the 234-mile Jaguar I-Pace. The Audi EV starts at $75,795, before federal tax credit and other incentives, while the I-Pace begins at $70,495. This week the Tesla – one of only two Model X trims still sold new, both with 100-kWh batteries – starts at $88,000 before incentives. (“This week” because Tesla has been changing configurations and prices with stunning frequency recently.). Mercedes-Benz hasn’t announced official range for its upcoming EQC crossover, another e-tron rival. But various test drivers in the U.S. have been pretty consistently reporting 200-230 miles in real-world use. The Mercedes-Benz EQC, due in the U.S. next year, is expected to start in the low $70,000s. On the up side, Audi says the e-tron has Level 3 fast-charge capability that can add almost 55 miles of range in just 20 minutes on a 150-kilowatt charger, and about 160 miles in half an hour. 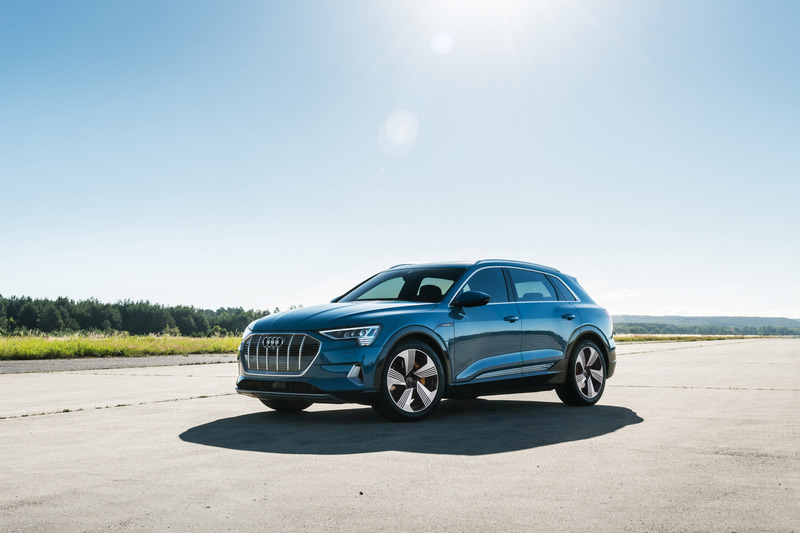 That should work well for anyone pondering a lengthy road trip – especially as Audi is giving e-tron owners up to 1,000 kWh of power at no cost when using the Electrify America network of Level 3 chargers that’s being built along the nation’s major highways. The e-tron’s 95-kWh battery gets the same U.S. warranty as everyone else’s; 8 years or 100,00 miles. To minimize degradation during those eight years, Audi’s battery management system won’t let the lithium-ion pack discharge more than 88 percent of its juice, keeping 12 percent in reserve. That big reserve reduces heat build-up as electrons are crammed into the battery cells during charging and drained out during use. But it means that only 83.6 kWh of the 95-kWh battery capacity is available to power the e-tron. The market will quickly let Audi know whether that’s enough.